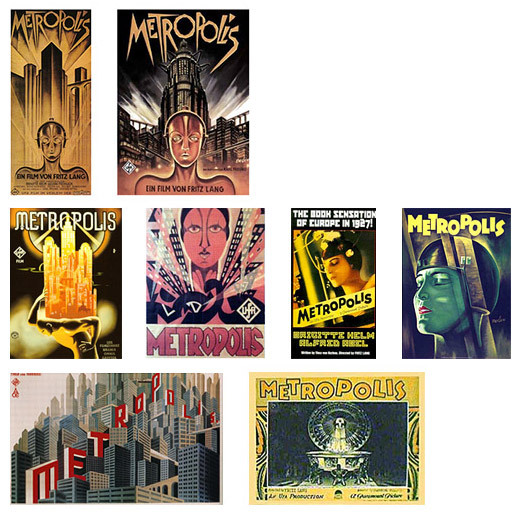 The Graphic Beauty of Metropolis. I have always been somewhat aware of the cinematic importance and visual beauty of the classic silent film Metropolis, but after seeing it’s television debut on Turner Classic Movies a couple of weeks ago, my socks were knocked off. Besides the social commentary it offered – which was great in it’s own right – the graphic and visual artistry is what truly captivated me. In general, I love the aesthetic richness of the black and white photography from silent films, but Metropolis not only offers that inherent monochromatic depth, it also mixes in an unbelievable understanding and execution of the art styles of the machine age. Constructivism, Futurism, Dada, Art Deco and a little Surrealism work to make this film some of the best eye-candy for any admirer of the graphic arts. From here-on-out I will let the graphic beauty speak for itself. And it isn’t just the celluloid itself that’s fantastic. The art associated with this film is equally gorgeous. In addition to it’s restoration, a reason this was shown on TCM is because of the recent discovery of almost 30 additional minutes that were cut from the film soon after it’s release. What an absolute treat it was for me to discover the beauty of this film first-hand. I do believe I have a new favorite movie. QR Code. The Missing Link. Here is the answer to your first question: Quick Response. That’s what is stands for. As for what it is. Basically it’s a bar code that is scanned and readable by mobile devices with a camera. The information encoded can be a URL, text, an email address, a phone number, an SMS short code, an RSS feed or other data. If you own a mobile device, simply download a QR Code Reader. (Some Android and Blackberry phones come with a reader already installed.) They’re free and abundant on the web. After installing the reader and opening the app, a simple picture of the code will initiate the creators intent. The example I have here will send you directly to a URL. If you are a marketer, there are many QR Code Generators available for free on the web. They’ll generate an image for you to use as needed – for print or web. The code itself is free from any usage license and is clearly defined and published as ISO standard. Denso Wave owns the patent rights on the QR Code, but has chosen not to exercise them. The technology was developed in the mid 90s but has only recently gained traction and widespread use in recent years – mostly in Japan. What does this mean – and how can I use it? Keep your eyes open. This may have more mainstream use in Japan, but it is starting to show up more and more in the States. Think of the marketing opportunities. Every retail package should have this code on it. As consumers become more and more tech savvy and smartphones become more commonplace the consumer – some of whom are already using bar code scanners for price comparing – will realize that a quick QR scan can send them to a site for instant product information. As a B2B manufacturer, you can now put critical information that’s instantly accessible like safety or hazard information, assembly instructions or service information right on your product. Non-profits such as The American Cancer Society can have a poster at a public event that has a code on it sending prospects directly to a donation site. Any ad can offer opting into an SMS program. The applications for this are endless – and if utilized properly a powerful marketing tool. Basically it’s just a link, but if you’re not using it, it’s a missing link and a lost sales opportunity. The ABCs of SEO – Search Engine Optimization made easy to understand. Part 1. Every business needs a web site but if that site isn’t easy to find by your prospects you’re losing potential sales. And guess who those sales are going to? YOUR COMPETITION. Especially the ones who have higher visibility and search engine ranking than you. That’s why it is so important for your site to be as optimized as possible. Ranking is where your web site appears after typing words in the search box of a search engine (i.e. Google, Yahoo or Bing). That resulting page is known as the search engine results page or SERP. The words that are typed into that search box are known as keywords, and every web site should have industry and company related keywords associated with it. The top-ranked result on the first page captures 42% of all clicked traffic, with each subsequent result below that receiving fewer and fewer clicks. What does that mean? That means that a) if you don’t appear on the first SERP there’s a good chance you may not be found on the internet and b) the higher you appear on the SERP the better your chances of being clicked-on. Being within the first three positions should be everyone’s SERP goal. How do you rank higher on the SERP? To answer that question you must first understand how search engines think. It is the intent of all search engines to put the most valuable information forward for it’s users, so they rank based on a combination of two things – Relevance and Authority. All search engines periodically return and re-crawl sites. They like to see change. The more often a site changes the more they view you as relevant and authoritative (they really hate stagnant sites). As important as keywords are (and they are very important) search engines love “authoritative” sites. A site is considered authoritative if it is linked to a lot, has constantly changing information, keywords match page content, are industry relevant and if the site is “all-over” cyberspace. So, how do you move up the SERP ladder? It’s associating the best (most relevant) keywords – the words someone types into the search box – with your site. And that means all forms of a word (singular, plural, and different variations of words) or phrases someone may use to find you. When developing a list of keywords, try thinking of what users looking for your business might type in the search box. Don’t underestimate the value of spending some time thinking about your site’s keywords – they are the backbone to SEO. It’s being as authoritative as possible. Simply stated, your authority is based on others linking to your site. The higher the authority of the site linking back to you, the higher authority your site receives. In other words, a link from CNN carries much more weight than a link from your nephews family page. And you get links by appearing to be as much of a leader in your industry as possible. Industry leaders offer insight worthy of being read – which in turn garners links back to your site. Read and answer blogs – or better yet write a blog revolving around your industry. Participate in industry forums and answer questions. Contact industry associations and trade publication sites and request a link to your site. Get listed in industry directories. These are all ways of being viewed as an industry leader. These are just some SEO basics. There are a variety of technical and programming methods along with a few “secrets” that should be implemented with every SEO strategy, but I’ll divulge those in an other article. Moving up the SERP ladder isn’t expensive – in fact it really doesn’t have to cost anything – but it is important to recognize that it does takes time and some effort. In the beginning it takes a number of search engine crawls before that good relevancy starts to takes hold. It also takes time to start to be considered an authority. Basically you’re building an on-line reputation – and that takes time. However, if you’re persistent and keep a visible and refreshed on-line presence, I can guarantee that you will steadily move up in the SERP rankings. Anatomy of a Logo. 5 Steps – Due Diligence to Final Files. I’ve developed hundreds of logos over the years and they’re designed primarily for 3 types of catagories. Corporate, product or event. Each catagory has it’s own design approach, but the goal is consistent – and that’s to communicate a message quickly and effectively while always keeping the brand in mind. Here’s a quick look at how I develop a logo. Not every designer follows the same path as me, but I’m sure that in some form or fashion these steps are taken. If you’re contracting someone to develop a logo for you, this is what to expect. 1: DUE DILIGENCE – This is as important a part of the project as any. It’s at this phase that lots and lots of questions should be asked. The brand should be fully understood. All unique aspects of the company, product or event should be understood. Any design expectations or limitations should be revealed as should all costs and timelines. 2: THUMBNAIL SKETCHES – Just about everyone expects to see some pretty refined and complete looking logos nowadays, but regardless of what the client sees for the first time, it’s essential that I first put pencil to paper. I’ll usually spend up to a day brainstorming, sketching and researching and put what amounts to doodles and thumbnails on paper. These are usually pretty crude, but it allows for a vision of what I want to accomplish to start to develop. Generally I’ll play with 10-20 directions before I feel comfortable enough to choose 5-8 of them to start developing more fully on the computer. 3: INITIAL CLIENT REVIEW – I’ll spend anywhere from 1-3 hours on each of 6-8 logos that then become part of my initial presentation. I usually have a pretty good idea which designs work the best, but I do include some that I may not think are as strong as others. I do this because the client may see value where I didn’t. If I need to, I can always explore that direction. Part of a good logo presentation is a strong rationale for the designs. Whether it’s in written form or part of an oral presentation understanding the reasons for design choices can turn a seemingly irrelevant logo into a winner. 4: REFINEMENT – After the initial review and feedback, time is spent refining 2 or 3 of the logos. This may include exploring new font choices, colors, illustrative elements, client requests or suggestions etc. This refinement phase may go 2, 3 or even 4 rounds. Each time narrowing down the choices to the best solution. 5: FINAL FILES – Once a final design is chosen, the last step is developing all the appropriate file formats necessary for today’s varied marketing needs. There are primarily 2 marketing applications where a logo will be used. One is for printed material – offset or digital and the other is for internet use. When using a logo that will be printed, a high resolution (300 DPI or higher) file is necessary. TIFF or EPS file formats are best and should to be saved as CMYK color files. For internet use, a low resolution file (72 DPI) is used and saved as RGB color. These need to be formatted as either a JPEG, PNG or GIF file. If you’re not receiving a variety of file formats at the end of a logo project, you may be missing a crucial file that will cost you to have converted by your vendor. Don’t get caught not receiving what you’ve paid for. I’d been a QuarkXPress user since the early days and extolled the benefits on a regular basis to my “PC” friends. When Adobe first took a stab at desktop publishing I was wary. I extensively used Adobe’s other graphic products such as Photoshop and Illustrator, but desktop publishing? No one was better than Quark. A few years back I upgraded to the Adobe Suite of products, so in addition to the latest and greatest image, drawing and web programs I happen to now own a new version of InDesign. It still took a comment a few months ago from a fellow designer about InDesign’s virtues for me to try it. And now I’m hooked. Without going into a side-by-side comparison (there are plenty of propeller heads that do that on-line) I will say that the interface is much more friendly. Especially if you’re familiar with any of the other Adobe product interfaces. Typographic features such as Space/Align are far less confusing using InDesign. Image links are so much easier to manage. They also offer full support of transparency in a TIFF file. The list go on –and I seem to discover something new and better the more I use it. This isn’t necessary a plug for InDesign – wait, maybe it is – but rather a suggestion that if you’re still on the Quark bandwagon, and especially if you already own InDesign but aren’t using it, I would suggest you give it a test drive. Trust me, you’ll like it. PS. Let’s also not forget that it costs hundreds of dollars less to purchase.